If you are having issues with your timer, most questions are addressed below. Please review the information below before contacting us. Q. I've lost my AC adaptor. What are the specificatons to replace it? A. All the K-series timers use a 9 volt, 600 milliamp adaptor (center positive, 2.5 x 5.5 millimeter). Q. Does the timer come with an AC adaptor? A. Yes the timer comes with an AC adapter, battery packs are available as an option. Q. If I buy a battery pack do I still get an AC adaptor? A. Yes, you get both an AC adapter and a battery pack. Q. How do I determine the model timer I have? A. 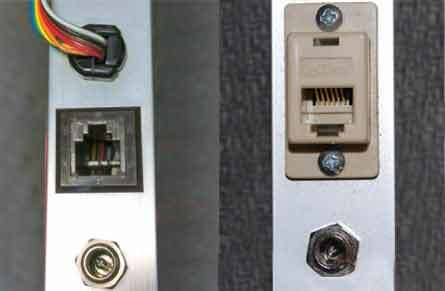 All of our K-series timers have a RJ11 telephone jack on the side post (see picture). If your timer does not have this jack , you have an old P-series timer. You can download instructions for the P-series timers on our Downloads page. Q. Do you still support the older P-series timers? A. We will try to support the older P-series timers, but be aware that these timers are over 15 years old and we have trouble getting parts. Also, Laser Gates are not available for these timers. Q. What is the resolution of your timer? A. Our timers are very accurate. Timer accuracy information. Q. How difficult is it to build a kit? A. This is the question asked the most by our customers. Find out more on the What is a Kit page. Q. If I already have one of your timers and I'm buying a new track, can I get it remade to fit the new track? A. Our Fast Track timers are custom-built to your original specifications. Unfortunately, we are unable to add lanes to your existing timer. However, we can retrofit your old timer to fit our Freedom aluminum track. Call us for a price quote. Q. My track lies flat on the floor. How do I mount the timer so the bottom rail will go underneath and the timer doesn't sag? A. Most tracks sit on junction blocks at each section. If yours doesn't, put 5/8" blocks underneath the track at each track section junction. Q. Is your timer double sided? A. No, but the K1 can be seen from both sides. Also we have a Double Vision option for $ that creates a double-sided timer. Q. Do Camera flashes affect your timer? A. No, we guarantee that camera flashes will not affect the timer. Q. Does the timer work in full sunlight? - Make sure no light is getting to the back of the sensors. Cover the back of the sensors with black tape. - Use a small hole in the track. 1/8 inch hole should work fine. - Make the interior of the hole flat black, or other dark color, so indirect light is not reflected down to the sensor. - Make the sensor hole deep. It should be at least 1/2 inch deep for best results. We have used J-B Weld, or J-B Kwik epoxy to fix holes that were too big. You can fill the big hole with the epoxy, then redrill them to a smaller size. The new hole will be a flat gray color that works well. - Put black electrical tape on either side of the hole in the track below the infrared transmitters to make a slot that will let in less light. See photo below. Q. My P-series Timer shows a 7, or my K-series timer shows a -. What can I do? A. '-' on a K-series timer or a "7" on a P-series timer means that the timer is not getting enough light. Make sure the infrared emmiters, mounted in the top of the finish line banner are pointed straight down. They may be gently bent into position until they are aimed properly. 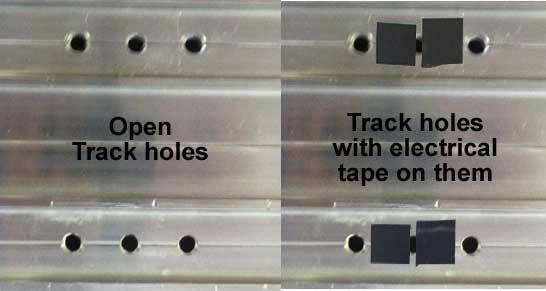 You can also check that the hole in the track lines up with the sensors below the track. Q. My timer won't display a time or a - , it just shows 0. What can I do? A. This means it is getting too much light. Usually the timer is not mounted on the track and light is getting in through the bottom of the timer. Q. I just glued the sensors in, and now the timer won't work. What happened? A. If you used silicon glue, you must wait 24 hours for the glue to dry completely before your timer will work. Q. I moved the circuit boards on my timer and now the lanes are showing the wrong results. What happened? A. Jumpers on the boards tell them which lanes results they should display. Just moving the board won't work. Lane 1 does not have a jumper since it is a master board for the whole timer. Give us a call for more information. Q. What does the button on the Laser Gate do? A. The laser gate has to be reset to work. Every time the cars break the infrared beam it will need to be reset before the cars go down the track again. That button is the gate reset button. Q. Do you need a computer to use the timer? A. No, the computer is an option but is not required to use any of our timers. All of our timers can work in a stand-alone mode. If any timer is used with a computer, it will send the times to it, even if the timer was not capable of displaying times. Q. I'm having trouble with my race management software. Who can I contact? A. The only race management software that we endorse is the Grand Prix Race Manager Pro. Q. My computer has a 9-pin serial port and won't receive times from the timer. What can I do? 1) PDA software is running. The icon for the PDA is down by the clock on the left bottom of the screen. Close any PDA software and try again. 2) IR port enabled. I think you can disable the IR port in the control panel. 3) Internal modem is on COM-1. Open FUNterm.exe for COM-1 and type AT. If you get back "OK" then you have an internal modem on COM-1. Maybe the serial port should be COM-2 but is disabled. 4) On some computers the default setting of the COM port is disabled to save power. IBM ThinkPad's do that. You will need to read the owners manual to find out how to enable it. If it is not the computer, you can tell if the timer's serial port is working by putting an LED across pins 2 and 5 of the nine-pin serial connector. The LED will glow if the LED leads are put in one way and the LED will not light if the LED is put in the other way. Once you verify that the LED comes on, then reverse the leads so that the LED is off. With the LED off, trip each lane. When the last lane is tripped the LED should flash. If the LED flashes, then the serial port on the timer is working. You can also test the cable with the LED by plugging the cable into the timer and then checking the LED at the other end of the cable - just like you did with the timer. You can get an LED from Radio Shack for about $2. The Radio Shack part number 276-309 (about a dozen other LED's they have will work). You can order them at Radio Shack by entering the part number. Q. I am using the USB to serial converter and I can't get my timer to communicate with the computer at all. Is there anything I can do? A. Most people start by connecting their timer to a computer using a USB to Serial convertor. The first thing to verify is that you have installed the driver that came with your USB to serial adaptor. To verify that the driver is installed you should use Windows Device Manager by going to Start -> Run and type in "Devmgmt.msc" and select OK. In Device Manager scroll down to "Ports (COM & LPT)" and hit the + next to expand it. On this list you should see your USB to serial adaptor if the driver is installed. If it is not listed here, check under "Other Devices" and see if you have a "USB-Serial Controller" or something similar with a yellow question mark listed next to it. If so, you do not have the driver installed. If the driver is not installed, first find the CD that came with your USB to serial adaptor. Put that CD in the drive and on the device manager screen select "USB-Serial Controller", right click and select Update Driver. Windows new hardware wizard will display. Tell it to search for the driver automatically and it should find it on the CD and install it for you. After the driver install is completed go back to Device Manager and see if it is listed under "Ports (COM & LPT)". If so, the driver was installed successfully. With the driver installed you will see the Com port listed right after the name in device manager. Some programs require a low Com port number (1 through 4), if so it is easy to change the Com port number. Just right click on the USB to Serial adaptor in device manager and select properties. Go to the port settings tab and hit the advanced button. On this screen there will be a display box with the port listed. Select the port that you desire from this list. You cannot pick the port if it is listed as in use. If you still cannot communicate with the computer, testing your port using the FUNterm.exe program (available as a free download from our utility download page) is the next step. FUNterm does not require an install. After you download it, just double click on FUNterm.exe. Once FUNterm starts, select the COMM menu and then click on CONFIG. Pick your com port from the list. Don't change anything else in the CONFIG window. After clicking on OK you will see an empty white box. The easiest way to get information sent to the computer is to unplug the power from the timer and plug it back in. When the timer powers up it sends a copyright and version number. If you receive this information, then your timer can communicate with the computer. If you do not see anything it is possible that you are connected to the wrong port, or that your port does not work. A quick test is to try to type in this box. If you see text, try typing AT - if you are connected to a modem it will send OK back. You could send a command like RV to our K-series timers and they will send back the version. If you cannot see anything you type then you are not connected to a device, or you could be connected to an older timer. You can short across pins 2 and 3 on the serial port coming from the computer and try typing. If your port is working you should see the text come back. If not I would try the timer on a different computer or with a USB to serial adaptor. If you are using Windows 8 or newer, make sure your USB to serial convertor is compatible with your computer's operating system. You may need to purchase a new adaptor because newer versions of Windows will not work with the old adaptor drivers. Q. I want to write my own software. What is the format of the timer's serial interface? A. The timer sends this string when all the cars have finished. It sends an "@" sign whenever the reset switch is closed. Also it sends a <LF> and a <CR> (That is ASCII code 10 and 13) at the end of each string. The serial settings to view the timer results yourself are 9600 baud, 8 bits, no parity, 1 stop bit, no flow control. With these settings you should be able to see the results in hyperterminal. Our K series timers support a new format. If the new format is enabled (send the command "N1") it will also send punctuation for all the places.